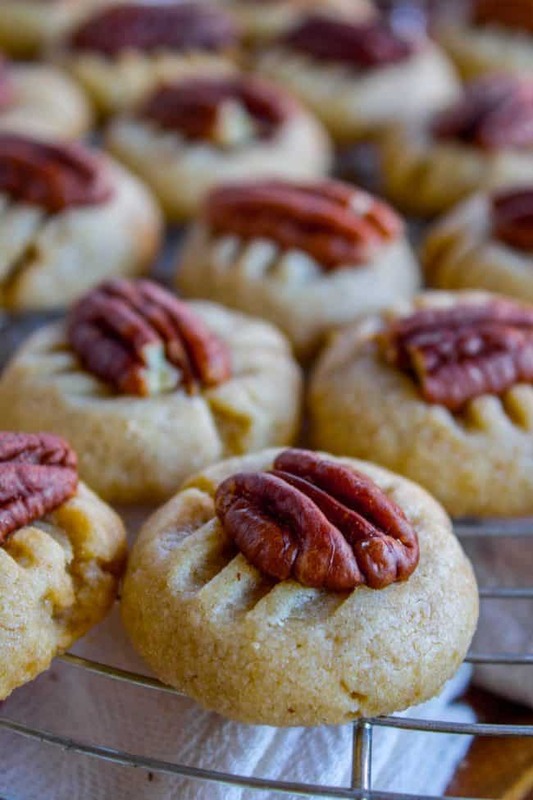 A buttery, brown-sugar-rich shortbread dough, nestled under a pecan half. 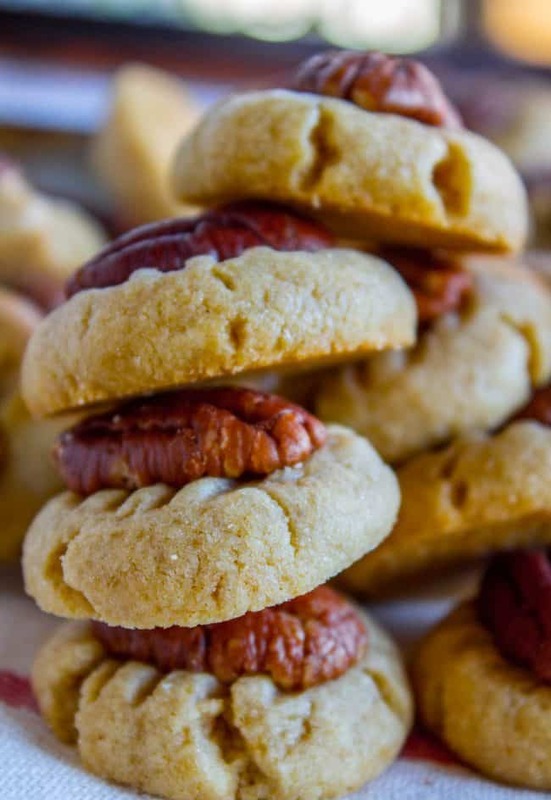 These Butter Pecan Cookies are a Swedish classic! They are perfect for cookie plates or to enjoy with some coffee or milk. Only 6 ingredients! So easy. It’s Christmas cookie season!! All the cookies, all day long! 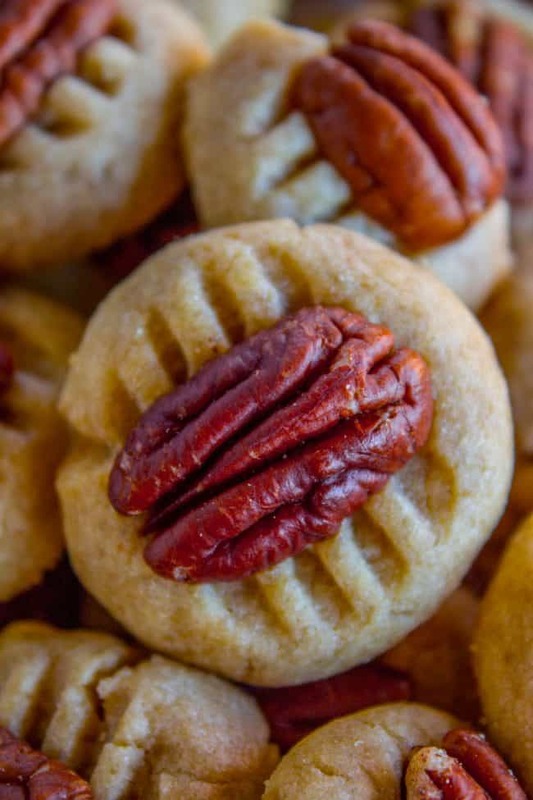 These Butter Pecans are the FIRST Christmas cookie I bake every year, without fail. They are a HUGE family favorite. It’s seriously impossible to eat just one. They are nice for cookie swaps because one batch makes 50-60 small cookies. 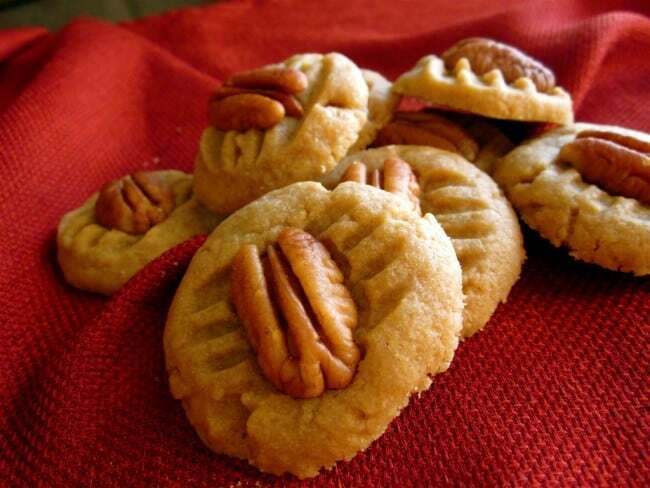 I started my blog in October of 2011, and posted this recipe for Butter Pecans just a couple months later on December 12, so you can tell that they are a priority recipe! Eric’s great-grandmother was Swedish. Grandma Prudy cooked a lot of traditional recipes from her native country that have been passed down. Eric’s family still uses many of the recipes*, especially around Christmas. They have a special dinner on Christmas Eve with traditional Swedish meatballs, boiled potatoes, rye bread, and of course tomato aspic. I am all about tradition, don’t get me wrong. Traditions are about family togetherness and I love them. I especially love them when they are delicious. Unfortunately tomato aspic does not fall under this category. How can you love what is essentially a tomato jello, even if it is dressed up in a bundt mold? I am not alone; even Eric admits that tomato aspic is revolting. In fact, I’m pretty sure that Bumpa (Eric’s grandpa, Prudie’s son) is the only one who eats the stuff every Christmas. This is the same man who also eats pickled herring on a regular basis. Just sayin’. The first year we were married, Eric and I went to my parent’s house for the holidays. We have our Christmas traditions too, and those traditions usually include lots of mashed potatoes and tri-tip. But to make Eric feel more at home, I decided to try to recreate his family’s Christmas Eve dinner, even down to the tomato aspic. Meatballs, check. The potatoes were good. The rye bread was good. The tomato aspic? Didn’t set up. So when we flipped that bundt mold over, instead of revealing our magnificently shaped (if nothing else) tomato jello, out came tomato soup with chunks of gelatin floating in it. Yum. Even if the tomato aspic tradition is doomed to die on this generations watch, Grandma Prudie’s Swedish cookie tradition is one that is bound to stick around. 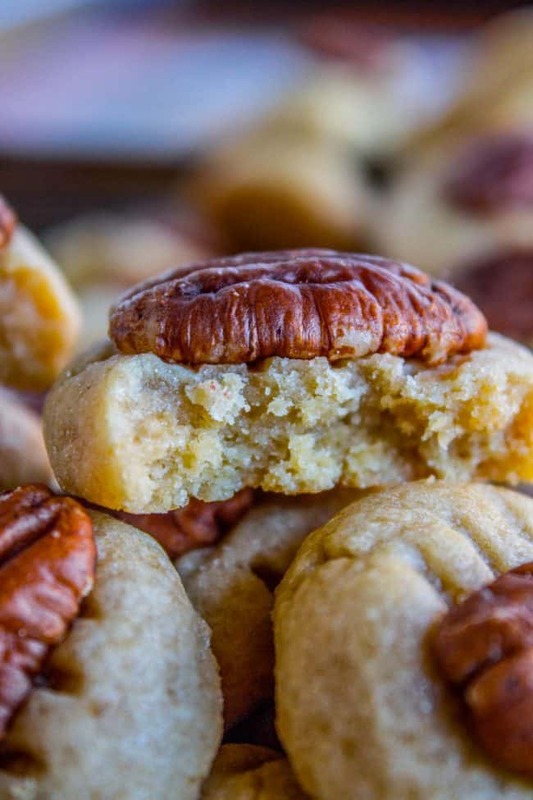 These Butter Pecans have 6 ingredients and are incredible. 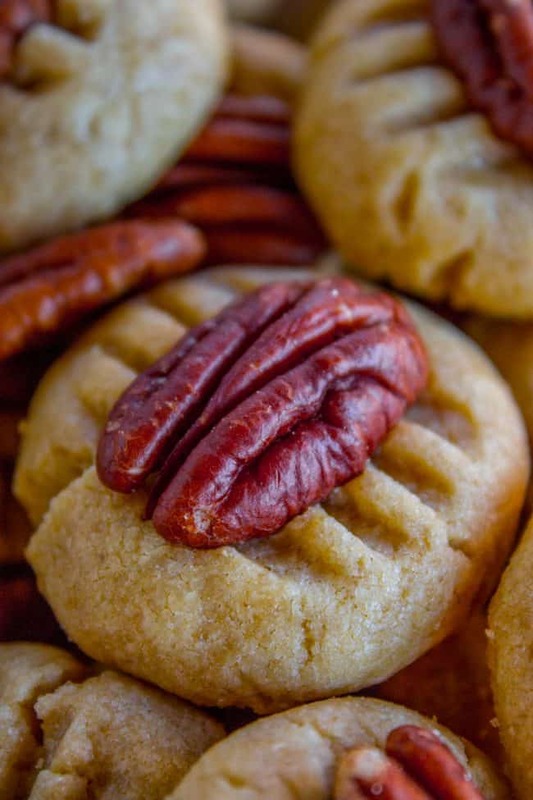 I’m usually not one for pecans (or any nuts, for that matter), but these cookies are addictive. Especially since they are tiny; it’s easy to throw down 8 or 9 before you’ve even realized what’s going on. Long live Butter Pecans. Tomato aspic, rest in peace. *Karen from Christmas Present chiming in. 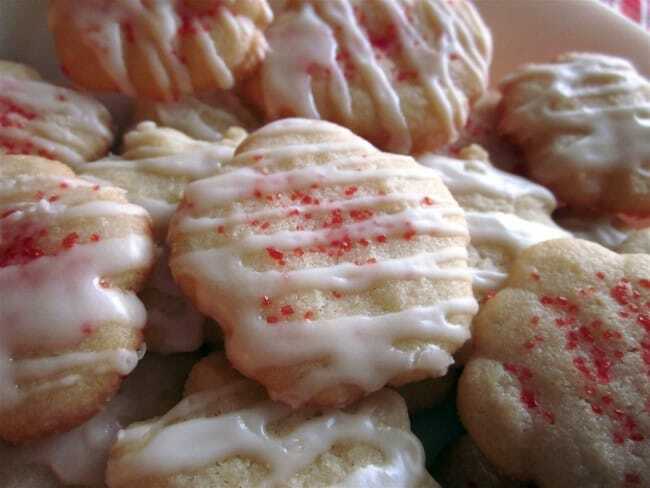 Here are some of Prudy’s famous cookie recipes I’ve shared since Butter Pecan’s original publication in 2011: Spritz, Gingersnaps, Sour Cream Twists, and Cardamom Cookies. There are so many more, I need to get on it! Two years ago: Chocolate Honey Chiffon Pie << a seriously underrated recipe. Huge favorite! 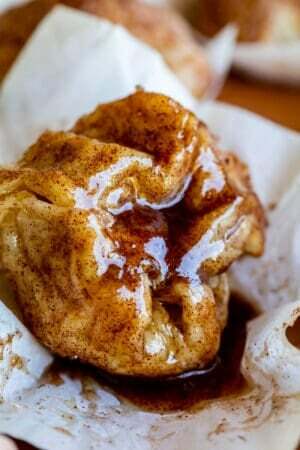 A buttery, brown-sugar-rich dough nestled under a pecan half. They never disappoint! In a large bowl or stand mixer, cream butter and brown sugar. Beat it for at least 2-3 minutes, stopping to scrape the sides and bottom. Preheat your oven to 350 degrees F. Line 2 large baking sheets with silicone baking mats or parchment paper. Form the dough into 1 inch balls. Place on the cookie sheet with one inch of space in between each cookie. Flatten each ball once with a fork. If the fork is sticking, dip it in flour, then press on the cookie. Press a pecan on top, perpendicular to the fork marks. Bake at 350 for 6-8 minutes or until they are no longer shiny on the top or edges. * I don't let mine get brown, or if they do, it is a very small amount on the bottom edges. 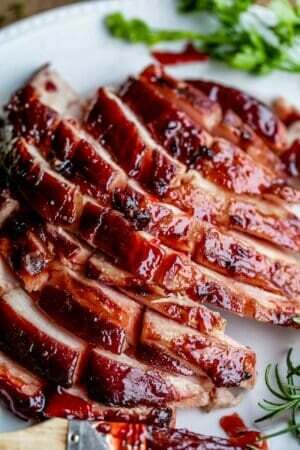 This recipe is from Grandma Prudie, Eric's great-grandmother. *The cook time on this recipe is MUCH DEBATED. I like to cook for a minimal amount of time (6-8 minutes) until the cookies are just cooked through. This way they are soft and stay that way for a few days. Kris, Eric's mom, likes very crunchy cookies and will leave them in the oven until they are brown and very crispy. The choice is yours! You can chill the dough for up to 3 days before using. If you need longer than that, throw it in a ziplock in the freezer. It will keep a long time! Let thaw on the counter until cold, then shape into balls. 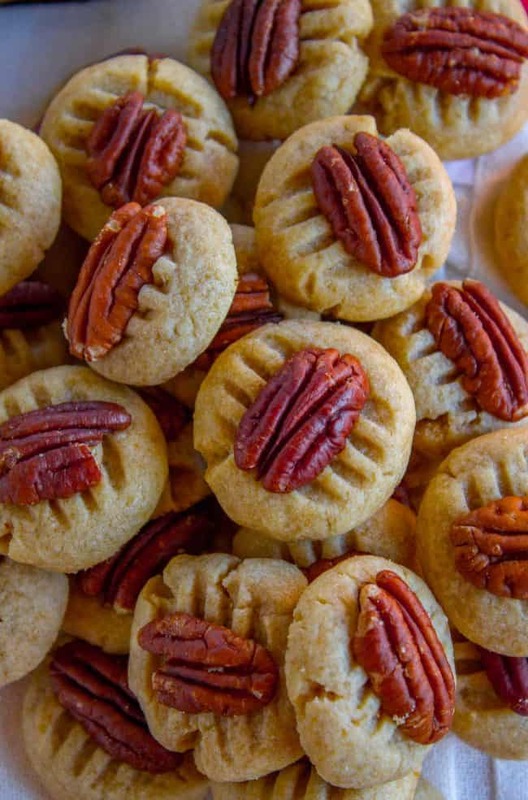 You can even shape the cookies, including the fork marks and the pecans, then store them in a tight container in the fridge or freezer, then bake up to 2-3 days later. More Christmas cookies to love! 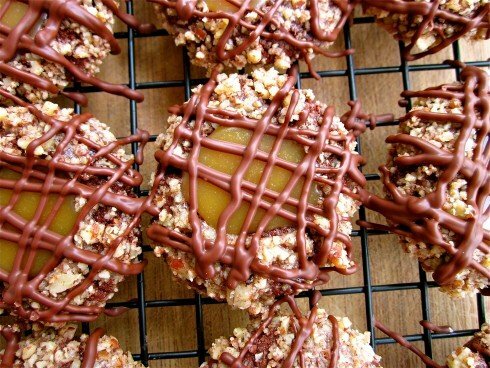 Caramel Pecan Thumbprint Cookies << these are a Better Homes and Gardens classic, they are perfect for cookie plates! Spritz << these are a Swedish classic from Eric’s Grandma Prudie. We make them every year! 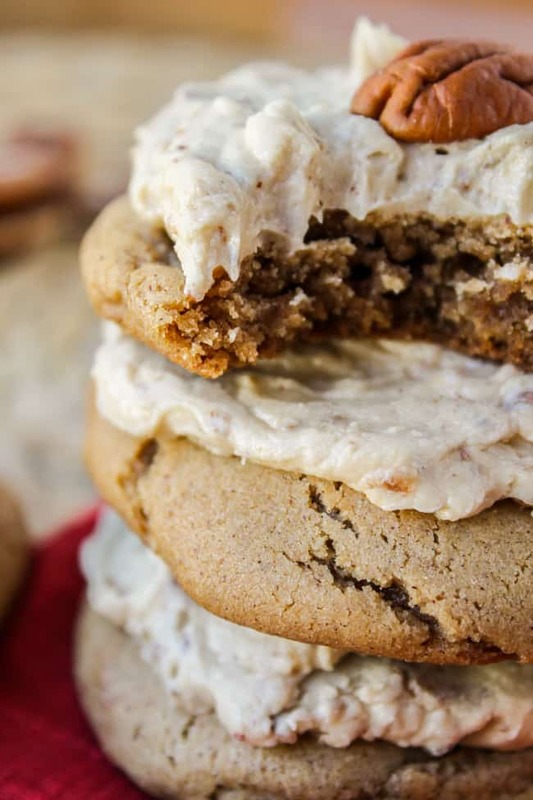 Other Butter Pecan-ish recipes that you will love! Ok, I consider baking one of my specialties. In saying that, I have tried the recipe twice. Once you add the flour, the dough turns to a texture like cornmeal. I refrigerated the second batch (after throwing away the first) and the dough is di crumbly you cannot gather into a ball. Has anyone else had this problem?? I am truly disappointed, as I so wanted to make and try these cookies after reading the reviews! Hi Bev! You might have to stir the flour in by hand if you don’t have a stand mixer. It sounds like the flour just isn’t getting mixed in all the way. 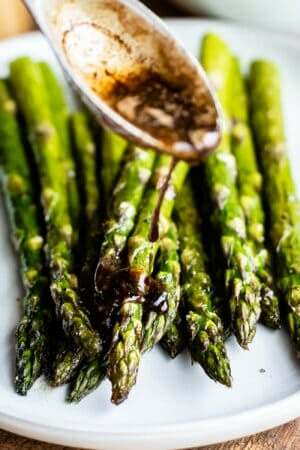 Are you following the recipe exactly, using real butter, etc? We’ve literally made this recipe hundreds of time in my family (it’s from 3 generations ago) so the recipe is definitely correct. I’m sorry you’re having trouble! Are you spooning your flour into the measuring cup? Thanks for the response! Yes, I use real butter (from Ireland), always spoon & level off my flour. I did use a stand mixer. I rarely have a recipe that doesn’t turn out. I just don’t understand what happened with this one! I give up. Ha ha. I made these today and they were so good! I can’t believe I’ve never come across them before. I hope the recipients will enjoy them as much as I did. I know they will Simone! Who can say no to fresh Butter Pecans! 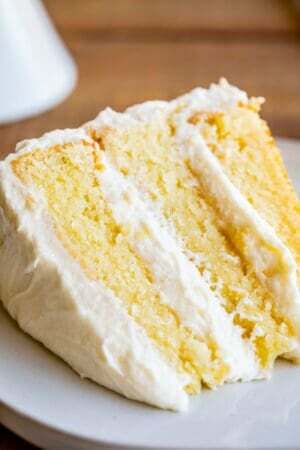 I’m so glad you liked the recipe, it is a family favorite. These are the easiest and tastiest cookies I’ve ever made. I’m so happy to hear that Lisa! It’s the first holiday cookie I make every year. I’m glad you love it too! The recipe made about 36 cookies with the smallest scoop I had. First time making them and will make them again for sure! Butter, delicious, melt in your mouth wonderful. I just made these, and they are DELICIOUS! My husband has already asked me to make another batch since the ones I made are to give to neighbors on cookie platters! As for cooking time, I’m in “Camp Middle.” I like the bottom slightly brown with a bit of “crisp,” but the rest of the cookie soft and melt-in-your-mouth good, which is how they turned out! I made these this year and I kick myself for not making them all the other times you posted this recipe on your blog! They are super duper easy to make and SO DELICIOUS! I had to hide them from myself before I ate them all! This is a must make recipe if you’re a cookie baker like I am! Thanks for sharing your husband’s family’s recipes! Merry Christmas! These cookies are so delicious! I’m in the cook-them-til-they’re-brown camp. I like them hard and crunchy because they’re EXTRA scrumptious this way! When you’re preparing this, make smaller than one-inch balls as they’re the perfect size when they’re small. Love this and will make them every year, if not more frequently! I may dip them in a little semi-sweet chocolate! Kris will be so proud to have you in the crunchy cookie camp! I think she gets a little lonely over there sometimes! ;) Yes, the smaller the ball, the higher the cookie-to-pecan ratio! Yum! And I LOVE the chocolate idea. Thanks so much for the review Laura, I’m glad you liked them! Merry Christmas! These cookies look DELICIOUS! I’m going to make them this afternoon since I have all the ingredients. I have to say, I’m pretty open minded about different foods, but that tomato aspic sounds (and looks after I did a Google search) disgusting! Have any of your kids tried it? Poor Kris is going to have to try to convert someone to a tomato aspic convert to keep the recipe/tradition alive! I’ve said it before, but it bears repeating……..your blog is THE BEST!!! The Butter Pecan cookies sound great . But what kind of flour ? Hey Jeannie! Regular all-purpose flour will work great. Enjoy! The cookie exchange was a huge hit and no one could believe how perfect my cookies turned out. They thought I bought them. When I showed them the recipe they were floored at how simple they were to make. They were a huge hit!! Haha! I love that they thought you bought them. That’s great. You’re a pro now Angie!! I’m so glad you like them Angie! These cookies are great for making huge batches and freezing them for later, so they should work great for your exchange. You should see Eric’s mom’s freezer at Christmas time. It is full to the BRIM with these cookies, and Spritz. One year he was being so bad about stealing them before they were fair game that she hid them and didn’t tell him where. He tore the house apart. On Christmas Eve she showed him…they had been hidden in his closet the whole time. Now you know what to do if you ever need to hide goodies from my ravenous husband. Hide them in his desk drawer or something. Anyway, good luck with your cookie exchange! That sounds fun! Make sure your dough is completely chilled before baking. Sometimes if you double or triple it you need more like 3 or 4 hours in the fridge before baking. And yes, I will keep the samples coming, for sure! Eric and I are going to gain a thousand pounds if I don’t! Perhaps I missed it, but I didn’t see a YIELD for the number of cookies your Butter Pecan Cookies recipe makes; I know it would depend on amount of dough per cookie. Making 1″ balls as your recipe suggests, approximately how many cookies would I get? Thank you. Do you think these would freeze well? I am making huge batches of cookies for the holidays. They sound delicious for my cookies tins. Absolutely Danielle! You can freeze them after they are baked, or freeze the dough. You should see my mother-in-laws freezer during the month of December. It is PACKED with tupperware after tupperware of Butter Pecans and Spritz. You would not believe how many of these cookies we eat every year :) Happy baking, and Merry Christmas! You all ate BAD tomato aspic. Ours is GOOD tomato aspic! My grandma made my dad eat tomatoe aspic growing up so he tried unsuccessfully to make us all try it… tomatoe jello is disgusting!!!! Thanks Sarah! I’m glad you like it! my grandma used to put disgusting things in gelatin, too, like walnuts and celery. what were they thinking? perhaps it would just be better if we put it all INSIDE the meatball, that could be tasty! I’ll leave the experimenting to you :) let me know how it turns out. 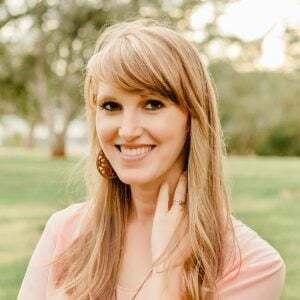 Wendy pointed me over to your blog, and I’m so glad she did! I loved this story. You’re hilarious, my dear. Thanks! I just checked out your blog and love it! I’m definitely going to try your Spinach Bacon Feta Pizza. Awesome! Thanks! Nice choice… I haven’t had that pizza in a long time, but it’s one of my favorites! My mom used to make something like this on Christmas Eve. I bet Brandon would love these. Ok, well you knew I WOULD have to leave a comment with all those jabs and negative words about one of my families’ traditional Christmas Eve delicacies! First of all, Tomato Aspic is a SALAD, Karen! A delicious, savory crunchy vegetable – filled salad! It tastes great with Swedish Meatballs. Also, I might add, that my dad is NOT the only one that eats it. (A lot of us also eat pickled herring, too – yum, yum) I throw down the glove! Someone in the next generation MUST carry on the the Tomato Aspic tradition!!! It CANNOT die an ignominious death with my children. Heehee. Maybe you can spoon-feed it to Charlotte this year and get her hooked. You will have to work on the grandchildren, because I’m pretty sure your own offspring have deserted camp-tomato-jello.